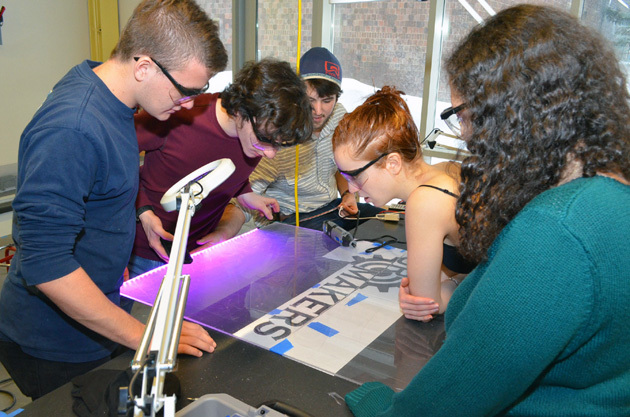 From left to right, Caulin Nelson, Steven Broida, Chris Smith, Lia Klein and Sarah Harari of the UR Makers student club, measure progress on the sign they're creating. Chris Smith has been taking things apart and putting them back together again since he was eight years old. “For Christmas I got an air compressor. Most kids get an Xbox,” he joked. Now the freshman in Mechanical Engineering is sharing his skills with fellow UR students as a member of – and mentor for -- a new club on campus. The goal of UR Makers is to bring together engineering, arts, and sciences students who like to design and build things – and want to learn how to use a variety of tools as they do so. Not for a class. Not for credit. Just for the fun of it. Their playground: The fabrication lab in Rettner Hall, with its state-of-the-art 3D printers, brand new Smithy 3 in 1 drill/mill/lathe machines, and plenty of space to spread out in, accessible 24/7. a “retro tear down” event, during which members took apart an aging computer monitor and other obsolete equipment donated by the University. tech talks on a variety of topics. Currently, club members are finishing up a cabinet with shelves and a plexiglass sign with the club’s name, illuminated with LED lighting. They will be displayed in the space UR Makers has been assigned in a corner of the lab. It is part of the club’s effort “to get our name out there,” Harari explained. During a recent Sunday meeting, everyone got a chance to use various tools. 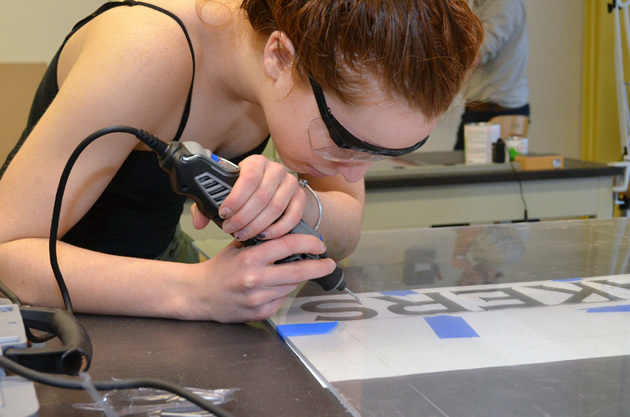 For example, Lia Klein, a sophomore in Computer Science, wielded a dremel tool (shown above) to etch the outline of the club’s name in the plexiglass sign. She had never used a dremel before she joined the club and received a 45-minute introduction to basic tools and safety with Jim Alkins, Rettner Hall’s Senior Laboratory Engineer who formerly headed a machine shop, as part of Research and Development at Kodak. In a nearby room, Steven Broida joyfully exchanged high fives with Caulin Nelson as the freshmen in Mechanical Engineering successfully cut notches in the cabinet, then fit shelves into them. This was Broida’s first experience using a power saw. “I’m learning as I use it,” he said proudly. UR Makers is open to students of all majors and interests, regardless of experience. Visit the UR Maker's page to learn more, or email URmakersclub@gmail.com. 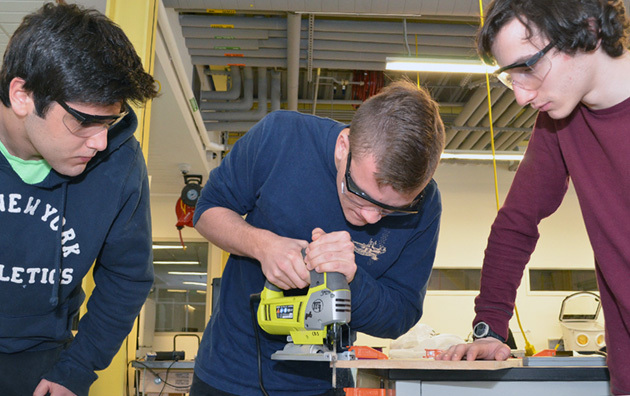 Mohamed Salah Mahmoudi '18 of BME, at left, and Steven Broida '18 of MechE look on as Caulin Nelson '18 of MechE applies finishing touches to the cabinet top.